Anaphylaxis is unpredictable. When it comes to potentially life-threatening allergic reactions (anaphylaxis), you need to have a plan. Your plan should include avoiding known allergens, recognizing the signs and symptoms of anaphylaxis, having access to two epinephrine auto-injectors at all times and seeking immediate emergency medical care should anaphylaxis occur. Mylan's epinephrine auto-injectors are the most prescribed epinephrine auto-injectors in the US— and have been for more than 25 years. *Many patients, caregivers and school nurses are already familiar with EpiPen® Auto-Injector and Mylan’s Authorized Generic for EpiPen®. Maybe you’ve heard of EpiPen® Auto-Injector or Mylan's Authorized Generic for EpiPen®…but what are they? Be prepared to act fast. If you, your child or someone you're caring for shows signs or symptoms of anaphylaxis, administer EpiPen® or EpiPen Jr® Auto-Injector, or their authorized generics, immediately as prescribed and seek emergency medical care. Have access to two doses of epinephrine at all times. EpiPen 2-Pak® and EpiPen Jr 2-Pak® cartons, as well as their authorized generics, contain two epinephrine auto-injectors (plus one Trainer that does not contain epinephrine or a needle).This follows national food allergy guidelines that recommend people at increased risk for anaphylaxis have two doses of epinephrine available at all times. EpiPen 2-Pak®, EpiPen Jr 2-Pak® and their authorized generics provide a second dose of epinephrine, which might be needed during a life-threatening allergic reaction. One reason is in case of what is called a protracted reaction—where symptoms may persist even after a first dose of epinephrine is administered. Another situation that may require a second dose of epinephrine is called a biphasic reaction—where symptoms may appear to go away but then come back, typically within 8 hours (sometimes up to 72 hours) after the initial allergic reaction. More than two doses of epinephrine for a single episode should be administered only under direct medical supervision.Talk to your healthcare professional if you need additional cartons of EpiPen 2-Pak®, EpiPen Jr 2-Pak® or their authorized generics to keep at work, school or other locations to help you have immediate access to two epinephrine auto-injectors in case of a life-threatening allergic reaction. 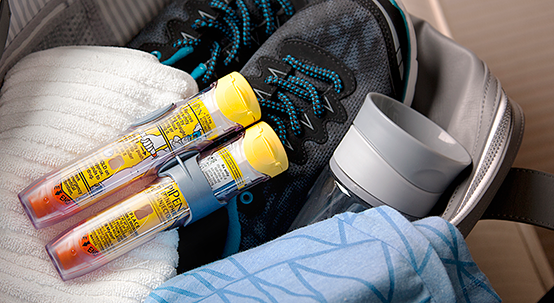 Every carton of EpiPen 2-Pak®, EpiPen Jr 2-Pak® and their authorized generics includes a Trainer auto-injector. Knowing how to correctly use your EpiPen® or EpiPen Jr® Auto-Injector, or their authorized generics, is essential, which is why every carton includes a needle-free, epinephrine-free Trainer.Practice with your Trainer and watch our step-by-step video. Also, make sure that anyone who may need to administer EpiPen® or EpiPen Jr® Auto-Injector, or their authorized generics, does the same. *Based on IMS data from 1987-July 2017.